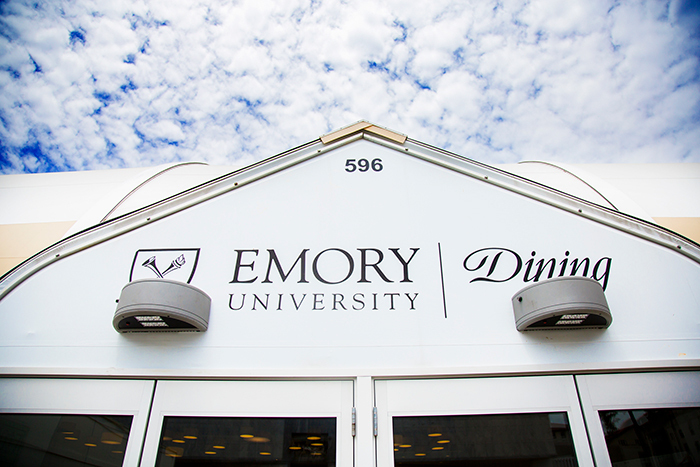 Take a look inside Emory's new interim dining facility, now serving food for a variety of summer programs and gearing up to offer upwards of 3,600 meals per day when students flock back to campus this fall. “The flow is much different than Dobbs Market,” Sunstein says. “There is one point of entry and exit, and a place to queue up inside, in case of inclement weather, and open food stations that offer better visibility. Located in the courtyard between the DUC and the Woodruff P.E. 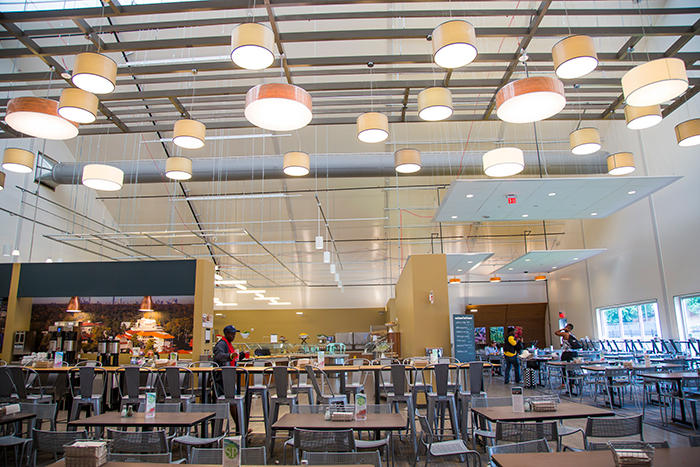 Center, the DUC-ling, as it’s been informally dubbed, is intended to serve as a temporary home for student diners during CLC construction over the next two years. The 10,000-square-foot facility is a 42-foot-tall tension fabric structure designed for durability, energy efficiency and quick assembly. 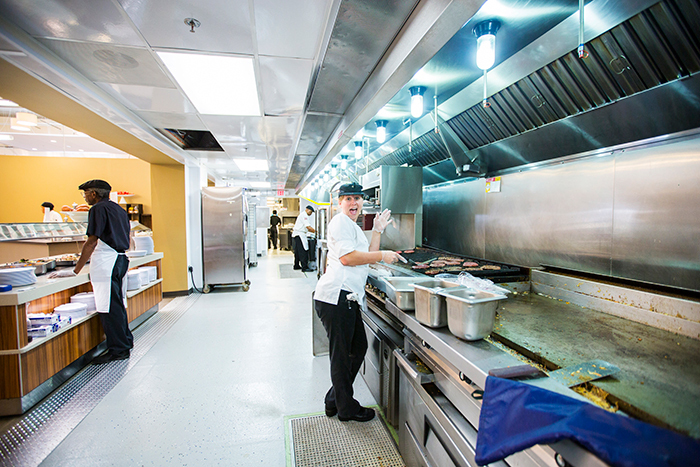 Modular kitchen units — not unlike temporary classrooms — are employed for food preparation and walk-in refrigerators and freezers that will be used to produce upwards of 3,600 meals a day when students return this fall. On sunny days, natural light spills through a translucent ceiling panel. Sleek, modern pendant lighting has been repurposed from a temporary executive dining facility once used by Harvard Business School. 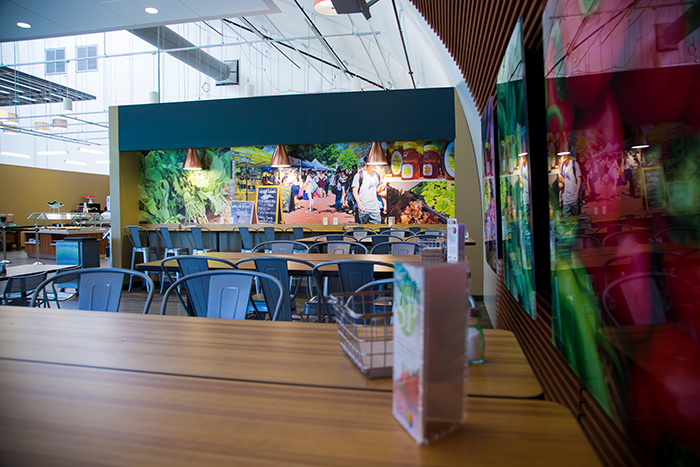 Photographic murals featuring familiar Emory scenes and food photography from the Oxford College Organic Farm brighten the walls. 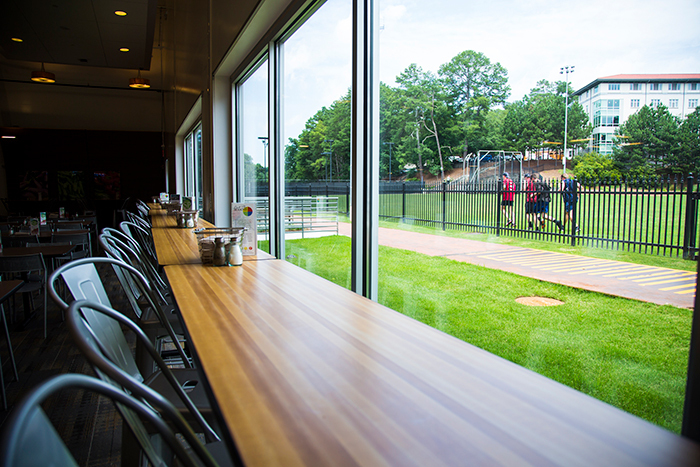 Seating options can accommodate more than 500 diners in a range of configurations, including standard six-person tables and individual bar-height seating, which includes a generous bank of seats directly overlooking McDonough Field. Suspended flat panels, called a “cloud system,” help moderate acoustics. 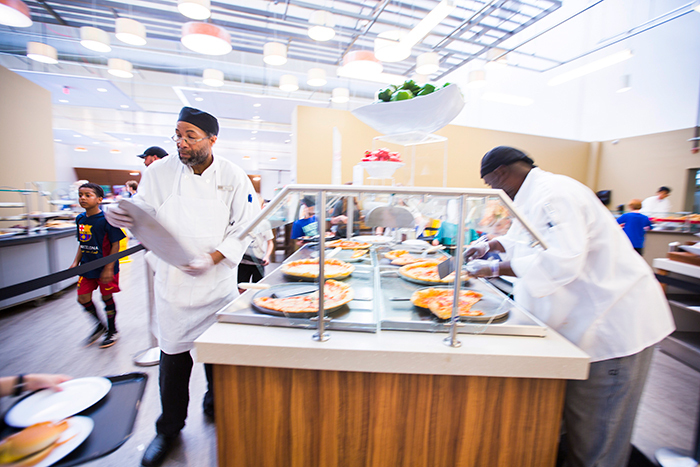 “At the height of lunch and dinner there are a lot of people in here and it’s just not that loud,” says Kimberly Triplett, director of operations with Bon Appetit Management, Emory’s food services vendor, who is managing the DUC-ling. 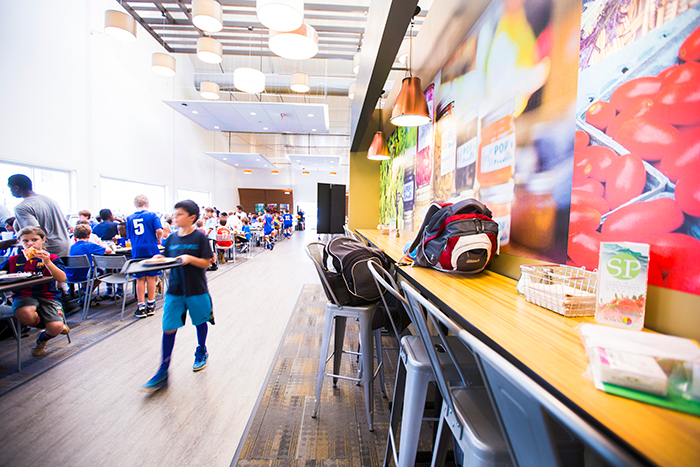 Diners enter the new facility and proceed straight toward the back wall, take a left, pick up trays and cutlery and enter “The Servery” to make food choices. A blackboard announces a fresh, regional rotation of produce offered that day from featured local farms including the Oxford College farm. 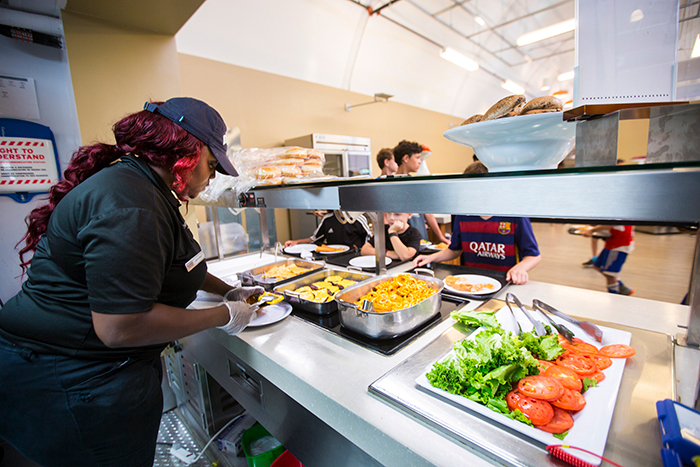 On a recent morning, summer guests selected breakfast items from a bread and pastry bar, an oatmeal kiosk and stations offering fresh fruits, main courses and grilled items. 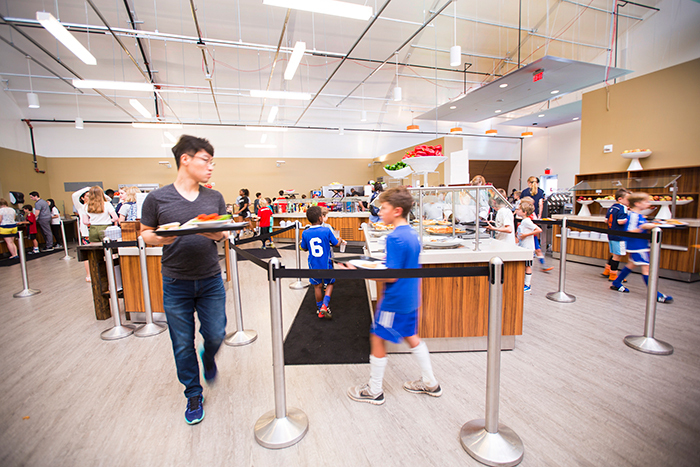 Later in the day, a double-sided salad bar, deli station and three pizza stations also come into play. Public interest in the new facility has been high. Triplett reports that Emory faculty, staff and summer students routinely stop by to check out the venue, along with curious campus visitors and nearby neighbors, joggers and fitness walkers. 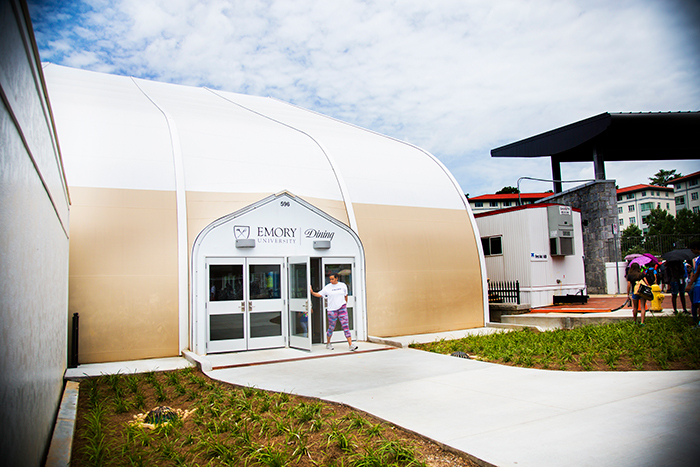 “There was a lot of talk when we heard that the DUC wasn’t there any more — we were imagining a small tent or something, but I knew it had to be big enough to handle all the students this fall,” Fedorowicz says. Sunstein says that faculty and staff may also dine at the DUC-ling for a flat door rate, which varies by meal, noting that menus will be expanded this fall. Summer dining plans are also available for undergraduate and graduate students. This fall, food service employees will be on site by 5 a.m. to begin food preparations, with service offered throughout the week, Triplett says. Brunch will also be offered on Saturdays and Sundays. Summer hours are now a bit truncated, she notes. Formal hours will be posted through a new CLC website, due to debut this summer. In the back of the house, food preparation takes place in a compact but efficient kitchen. A few pieces of key equipment were transferred from Dobbs Market, but much of it is leased for the time being. All of it speaks to the sheer volume of scratch-cooked food that is produced here daily. Eight ovens — including the flexible ConvoTherms, state-of-the-art ovens that use convection and steam at the same time — are the workhorses of the kitchen. Cooks work with barrel-sized commercial vats, employing immersion blenders the size of yard tools. More than 130 handmade pizzas, produced daily this summer, are stowed on towering rolling racks. Walk-in coolers and freezers are the length of an Airstream trailer. Just out the back door, where deliveries are made to a dedicated loading dock, is a reminder that this continues to be a zero-waste operation. All recycled goods are compacted; compost is sorted into pre-consumer and post-consumer then stored in rolling bins for later collection.